CinemaFrame® is the world's first completely concealed, high-performance home entertainment system designed for... you, actually. Our inspiration came from decades of working alongside architects, interior designers and builders on a wide variety of projects. We saw firsthand the difficulties you faced trying to integrate or hide all of the technology clients seem to inevitably want. So we asked: how can we deliver the technology clients demand without disrupting the design intent for the space? After 4 years of designing, testing, prototyping and more testing, we created a single solution that thoughtfully balances form and function. CinemaFrame complements any space. We worked with Maharam to create over 120 different styles and colors of fabric for the slim frame that surrounds the TV. You can specify from our collection, or provide a COM sample and we’ll test it to ensure everything works perfectly. CinemaFrame was designed from the ground up as a single, simple, no-compromise entertainment solution. One system does it all, without intruding on your carefully designed interior. CinemaFrame works with virtually any make or model of TV, delivers the very highest picture quality available and supports screen sizes from 46” to 75”. We designed CinemaFrame for actual people (including those without advanced degrees in technology). The entire system operates simply and easily using a single, intuitive remote control. Or use your phone or tablet if you prefer. We made CinemaFrame for more than just TV and movies. In fact, the sound system works just as well with the TV off, whether you're enjoying a new playlist, favorite podcast, or relaxing to some treasured vinyl. Amazing, high-quality sound, no visible speakers. Some equipment, like game consoles or a turntable, need to be accessible, so cannot be mounted within CinemaFrame. So we created a small, elegant connection panel that can be remotely located on a wall behind furniture or inside millwork to create a simple, clean solution. We’ve partnered with a select group of AV Professionals in key markets across North America. These premium Dealer Partners will take care of every detail, providing complete installation services and ongoing client care. Project success depends on getting the information you need, when you need it. So we’ve dedicated folks on our team to work directly with the A&D community. Fill out a contact form here or call us directly and we’ll make sure you get all the answers you need. Really. The only visible part of the CinemaFrame system is the TV, surrounded by a slim frame of acoustically transparent fabric. Our collection includes a wide variety of styles and colors to allow you to perfectly complement any space. Whether you want something that will blend in and visually disappear, or something bold and high contrast, the choice is yours. 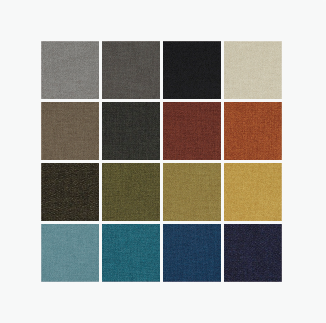 Click here to see a selection of the available fabrics. Now it's easy to explore all about CinemaFrame using our brand new app created for AppleTV ®. Visit the app store on your Apple TV and search for CinemaFrame to find out more. Millson, Canadian technology and luxury space experts, invented and patented CinemaFrame. We've spent decades designing and integrating technology solutions for thousands of projects. Our relationship with design professionals informed what would become a core philosophy: to ensure architecture and interior design always take center stage, and never the technology. Learn more about Millson at millson.net.